Are you stressed out over the holidays? Could you use an extra dose of cheer? 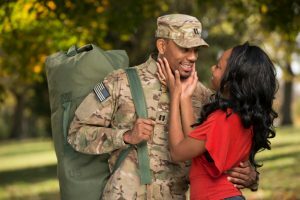 Watch these heartwarming surprise military homecoming videos and get ready for some of the sweetest surprises caught on camera. Grab the tissues and share in the joy of these happy reunions! A visit from Santa is actually a big surprise for a military mom. Army Capt. Dawn McCracken-Bruce reunites with her two sons as they sit on Santa’s lap…but the children aren’t the only ones who are taken by surprise. A soldier comes home from Kuwait earlier than expected and gives his family a shock at a mall. A three-year-old girl’s wish for her daddy to come home for Christmas comes true. PFC Hunter Taylor comes home from Afghanistan and surprises his family at a Blackhawks game. A U.S. Army Captain appears on Good Morning America thinking he is going to send a holiday greeting to his fellow troops overseas, but he is actually being reunited with his family. A nurse gets an on-the-job Santa surprise from her son Army Specialist Travis Ruggiero who just returned from Afghanistan. A family watching a Christmas parade receives an early holiday present.